The college basketball season concludes with a 68-team, fixed bracket, single elimination, tournament to decide a National Champion. It is officially named the NCAA Men’s Division I Basketball Tournament and traditionally is nicknamed The Big Dance. In more recent years it has become best known as March Madness which is the branding CBS/Turner created for television coverage. March Madness and the NFL Super Bowl are the two biggest times of the year for sports gambling in the United States. People who gamble at no other time of the year get involved. For March Madness this is via contests called bracket pools. During his time as United States President, Barack Obama often discussed on television which teams he had in his brackets. It sincerely is that big of a deal and bracket participation is widespread. I remember back in grade school our lunch ladies having a pool. This is also a time that sees a major boost in online betting activity. The majority of online sportsbooks that are focused on North America increase their sign up bonuses, offer generous reload bonuses, and some even run bracket pools themselves. The websites below are those known for being the most generous this time of the year. BetOnline, Bovada and TopBet are among those known to offer the most generous reload bonus to clients year to year. Even if not betting extensively with all of them this season, if you like bonuses you will want to have an account at each. If not already having an account, sign up this season and expect next season to be emailed an oversized reload bonus offer. Intertops is one of the two sportsbooks recommended by Sports Betting Online that offers both a reload bonus and their own bracket contest. In most recent seasons it has been a 25% up to $250 cash deposit bonus offered for both the First Round and the Final 4 (so $500 in cash bonuses total!). There is also a 63 selection bracket pool that can be entered for free. As long as you bet at least $100 during the tournament you are qualified to share in the $25,000 prize pool that is split with those who make the most correct picks. The other recommended sportsbook with their own bracket contest and reload bonus is bookmaker.eu. Their bracket pool pays $10,000 to first, $5,000 to second, $2,500 to third and has other prizes for lower positions. Entry can be purchased direct at $10 per bracket. For every $300 deposited to their sportsbook from March 1 to the start of the First Round, one free bracket entry is given too. The sign up and reload bonus offer is also published on their website. 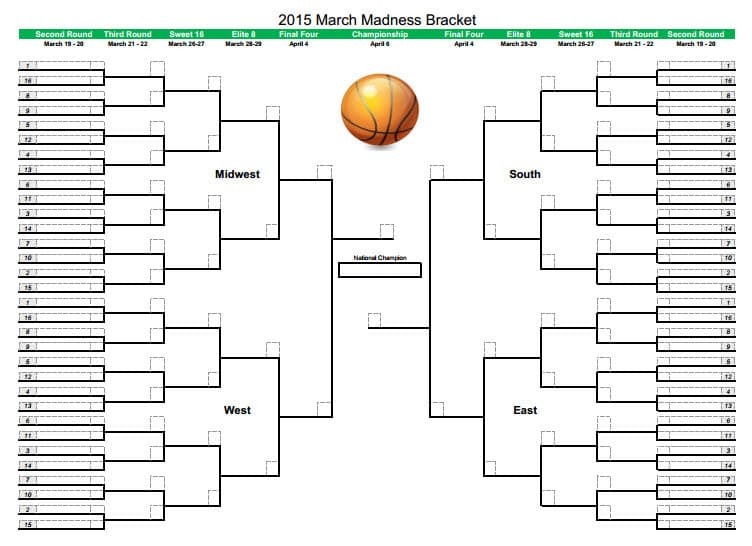 What Exactly is a March Madness Bracket? The NCAA tournament to decide a national champion is a fixed-bracket single elimination. . Of the 347 Division 1 schools, 68 make the tournament. All NCAA conferences, beside the Ivy League, have their own end of the season tournament that happens first. The 32 winners get an automatic bid. The other 36 teams are decided by a selection committee and are called at large bids. All teams are also given seeds by this committee. There is one slightly confusing aspect to explain. The tournament has teams placed into 4 regions where they are seeded #1 to #16. But there are 17 teams per region, not 16. The tournament starts with 8 teams playing in 4 games called the First Four. These are the four lowest seeded automatic qualifiers and four lowest seeded at large teams playing each other. The teams playing each other in the First Four carry the same seed number. So there might be two #16 seeds in two of the regions, and two #11 seeds in the other two. Once those games are complete, each region has only one of each seed. As you can see, it uses a fixed bracket. In the field of 64 called the First Round ,the matches are 1 vs. 16, 2 vs. 15, 3 vs. 14, 4 vs. 13, 5 vs 12, 6 vs. 11, 7 vs. 10 and 8 vs. 9 in each of the four groups. The round of 32 match ups are then decided by the bracket which you can follow above. For example, the winner of 1 vs. 16 and winner of 8 vs. 9 play each other in the field of 32 called the Second Round. It then progresses to the Sweet 16, Elite 8, Final 4, and Championship Game. When all this is finished we have a National Champion. Bracket pools involve participants simply filling out a bracket in advanced for all 63 games played in the tournament. So, you select the 32 winners of round 1 and write them in the bracket. This will give you 16 games to fill the winners in for Round 2. You keep progressing, entering the 8 winners from Sweet 16, 4 winners from Elite 8, etc. until you get to deciding on the champion. The winner of the pool is determined by which entry has earned the most points. Scoring method varies between pools. In most you get a flat number of points for each correct selection per round. This is generally progressive, e.g. 2 points for the First Round, 3 for the Second, 5 for the Sweet 16, 7 for the Elite 8, 9 for the Final 4 and 12 for the Championship game. That is just an example. Each pool has its own scoring system decided by who is running it. The overall winner is decided by the person with the most points. As for finding a bracket pool to enter, as mentioned Intertops and bookmaker.eu each have one available to enter. The chances are you know multiple people who are either organizing their own pool or know of one you can enter. These are common in bars, offices, and all walks of life. There are other non-sports betting related companies that offer free pools too. Last year Quicken Loans ran a Bracket Challenge through Yahoo Sports, where Warren Buffet agreed to pay USD $1 billion to anyone with a 100% correct bracket. This sounds insane but the chances of getting all 63 selections correct were estimated to be 1 in 128 billion . This particular pool was capped at 15 million entries. Still with USD $1 billion on the line for free, there is no harm in taking a shot. Bracket pools are so popular that even in states where gambling is illegal, they are mostly tolerated. It is something a huge percentage of the population does to make March Madness more interesting. Major news media that are not even focused on sports, produce strategy content each year. The strategy behind creating a bracket more likely to win has been nicknamed bracketology. Googling this term is sure to throw up lots of strategy and ideas to help you on your way to attempting to pick the perfect bracket.